Yes, it is a fantastic video. The best video I've ever seen about the Blur Busters technique that RTINGS implements for their motion blur photography! They credit Blur Busters at the end at 3m10s. Play this video at 60 frames per second for the best demonstration. Granted, there can be a lot of variances and asymmetry (e.g. speed changes that makes motion blurring very uneven, etc) but this is an excellent general rule of thumb to judge if your pursuit camera photos are good enough (for your accuracy target), or that you need to keep trying. Generally, the momentum of a heavy camera will almost always not show meaningfully visible speed changes (within one exposure) when coasting mid-pursuit, so you'll usually get consistent leading/trailing motion blur error margin instead of asymmetric motion blurring due to acceleration/deceleration effects. Occasional single-pixel color distortions (green, purple), like seen in this above photo, are caused by LCD inversion algorithms -- on certain 120Hz monitors you will see green/purple discoloration effects of certain moving single-pixel checkerboard test patterns. In general, just ignore these minor discolorations; they don't affect motion blur (albiet may sometimes slightly tint the color of motion blur). That said, this infographic highlights the minimum extra motion blurring that gets added to imperfect pursuit photographs. Other error factors (camera focus, blurring by compression codecs, etc) are not included but are usually much smaller than this easily-measurable error margins. ...I've recently learned 2 reviewers are mid-air pursuiting their cameras successfully with subpixel precision. No camera rail! At least 1 of them do it by a rapid-shoot feature (e.g. 24 photos per second, almost film-like) and then hunt for the sharpest photo quickly using a rapid photo viewer. I'm pretty sure software could be written to automatically find the sharpest photo of the whole bunch (least amount of motion blur). You can even use video too (assuming you can control exposure per frame), and find the clearest stillframe. --> Mid-air hand pursuit camera is actually a scientifically-viable option too. Just hand-wave the camera while in auto-shoot mode. --> HD or 4K Video is a legitimate alternative of camera auto-shoot, by giving you 24 frames or 30 frames per second; as long as you can adjust exact exposure length per frame. You hunt find the clearest stillframe, and use that as the pursuit camera photo. Manual focus, manual exposure, manual iris (F stop), then you can essentially use video as a method of auto-shooting 30 photos per second. With a good player that can playback during slider sliding -- and also has single frame stepping -- you can quickly hone on that 'perfect' frame. No camera rail needed. 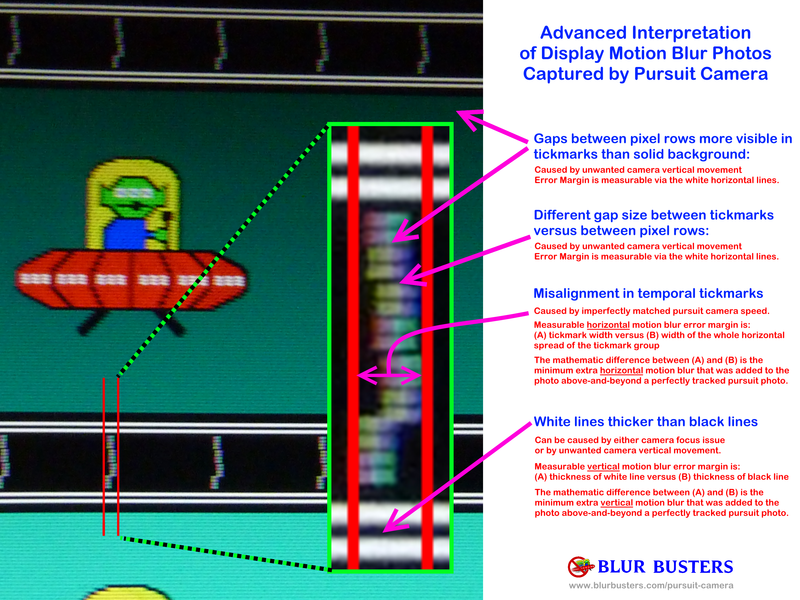 Note -- The pursuit camera temporal patterns are also compatible for use with motorized pursuit cameras (including those that have precision manual speeds not synchronized to the display) -- the temporal pattern can also double as accuracy verification for mechanical pursuit cameras. So the expensive mechanical setups can still benefit from the use of the temporal tick marks invention, too. So it cover all extremes from hand-waved smartphone cameras all the way to expensive mechanical pursuit cameras! Want the world's easiest pursuit camera?